But his bid in 1933 to become the youngest world champion in history stalled by a single ball. 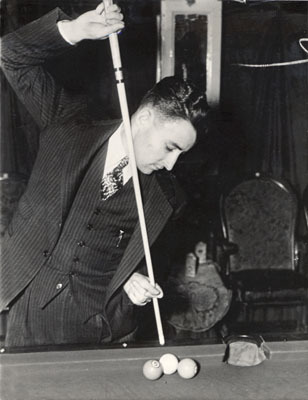 An unknown in the early 1930s, Mosconi made a name for himself against the giants of the game. In 1933, just as King Kong was scaling the Empire State Building and work was beginning on the Golden Gate Bridge in San Francisco, Eddie Brown, a Philadelphia pool shark of modest reputation, came down with the abdominal malady known as peritonitis. Brown was rushed to the hospital, got an appendectomy, and then died two weeks later. The poor SOB was just 24 years old. Although Brown no doubt was irritated by this turn of events, he did manage to earn himself, in death, a small part of pocket billiards history. For had Brown not died when he did, there would have been no open slot in an important local tournament that year. If Brown had not died when he did, then one Izzie Goodman, the owner of Fox Billiard Academy, would not have gone looking for Brown's replacement. With the end of Eddie Brown, the tournament career of William Joseph Mosconi began. I devote this month's column to that startling debut, and Mosconi's appearance in the 1933 world title event just a few months later. Mosconi came one ball short of winning pool's top prize that year, on his very first attempt. He would have been the youngest world champion ever. Much of what appears here comes from separate research I'm conducting for an upcoming book. Included are excerpts from the Chicago Daily News, the Chicago Daily Tribune, the New York Times and the Minneapolis Star. I've also interviewed billiard historian Charles Ursitti, and reviewed Mosconi's memoirs, written with Stanley Cohen. At the time of Eddie Brown's death, the Billiard Association of America was preparing for its next world event - to be held that year in Chicago, but with qualifying events in other major cities. Willie, then 20, was shuffling around Philadelphia poolrooms, mostly Frankie Mason's, earning what he could through gambling. The nation then was soldiering through the Great Depression, his father was sick and out of work, and the family could have faced starvation if not for Willie's prowess with a pool cue. Peritonitis was the same disease that killed magician Harry Houdini seven years earlier. Eddie's diagnosis left Izzie Goodman, owner of Fox Billiard Academy, in a lurch. The room owners sponsored players for the Billiard Association of America qualifying events, and Izzie had sponsored Eddie. "Izzie had already paid the entry fee, so he asked me if I could take Eddie's place," recalled Mosconi in his memoirs.